Nebraska death penalty ban: Governor vows to veto legislature's vote to outlaw executions, buys drugs from India. Lawmakers in Nebraska’s unicameral legislature voted Wednesday to abolish the state’s death penalty by a margin of 32-15—which is likely enough support to overcome a veto threatened by Gov. Pete Ricketts, who recently committed more than $54,000 in public funds to procure execution drugs from a pharmeutical company in India. 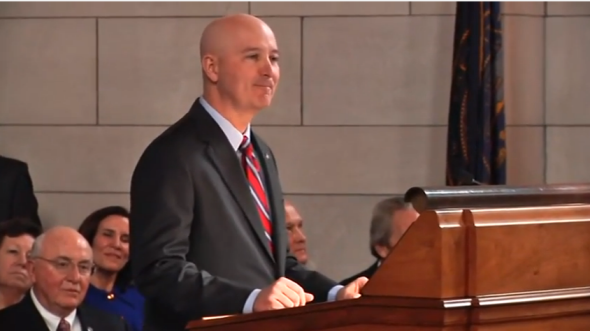 “No one has traveled the state more than I have in the past 18 months, and everywhere I go there is overwhelming support for keeping the death penalty in Nebraska,” Ricketts, a Republican, said ahead of the [final] vote. Nebraska’s use of the death penalty is relatively rare, with no executions carried out in the past 18 years and only 22 since 1901. Eleven inmates are on Nebraska’s death row today, including one who has been there for 35 years. Gov. Ricketts’ administration is facing a lawsuit from his state’s chapter of the American Civil Liberties Union over his recent rush to acquire execution drugs, an increasingly difficult proposition for corrections authorities in the United States. While a state law compelled by a 2008 court case requires that authorities execute prisoners using lethal injections, Nebraska has never performed one: the last prisoner put to death by Nebraska, Robert Williams, died in the electric chair in 1997.